IQUALIF CPE extracts 40% more contacts than our competitors. A real advantage in terms of time and efficiency. IQUALIF extracts mass or targeted data, including addresses, email addresses, phone numbers: an effective way to expand business prospects, on a B2B and B2C basis. IQUALIF software extracts data from the Yellow or White Pages and saves them in Excel format. 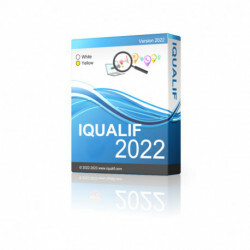 The range of available versions of IQUALIF enable users to cover the vast majority of French-speaking and English-speaking countries, and more. IQUALIF is useful for all professionals and for businesses such as call centres, communications and advertising agencies, real estate agencies, all marketing professionals and the private or public sector that wish to expand their activities or make themselves known. White scraper versions extract data from individual listings by title, name, address, telephone number, average age and collective or individual housing. Yellow extractors allow companies to extract lists by name, address, telephone number, fax, website and email address, where such information is available. This software is an essential tool for expanding your market prospects, giving you the possibility to create customer files, forms and qualification files. It can scrape up to 40% more contacts than competitors and collect full contact details for prospective clients. IQUALIF is used to collect mass or targeted data from the White or, Yellow pages directories. IQUALIF White and Yellow is used to extract individual data and business contacts from the White and Yellow Pages directories of several countries. This software is an essential tool to expand your market prospects, giving you the possibility to create customer files, forms and qualification files. This software enables you capture up to 40% more contacts than competitors, and collect complete contact information. How do I install IQUALIF? How do I use IQUALIF? How do I uninstall IQUALIF? The Yellow version records contacts' email addresses when the information is available on the company's online Yellow Pages profile. It then updates email addresses not found on the Yellow Pages site directly from the websites of companies that have one. IQUALIF specialises in capturing and extracting data from the Yellow or White Pages of several countries. Web scraping or data mining can also be extended to other areas or sites according to your business needs. Ideal for CALL CENTERS and CONTACT CENTERS but also for traders, artisans and professionals who want to introduce or find new customers and expand their activity base. What is IQUALIF? IQUALIF is a tool for obtaining the full details of a city's residents and can filter results by specific criteria. Our strengths: new customers will always have up-to-date information captured from official directories in real-time. In addition, our solutions allow for the extraction of up to 20,000 sheets per hour. Do you want a product customised to your specific business needs, or do you need to find software that is able to extract the right type of information (from pap, forums or specialized search sites)? Contact us! We also provide made-to-measure solutions. Our aim is to provide customers with powerful Tools, with a quality a step above those already on the market. IQUALIF is an easy-to-use, fast, efficient and reliable web scraping services for all qualification files. IQUALIF CPE is now available in six categories IQUALIF France, IQUALIF Belgium, Switzerland and IQUALIF Luxembourg, Canada and Polynesia so that your commercial ambitions can go even further! Find them all on the download page. Free trials available for all versions. - Recovering complete contact information => names, addresses, telephone numbers, email and company names, etc. In a continuous search for improvement, IQUALIF has developed an offer that allows you to increase your productivity and improve your revenue streams. Our solution is the ideal entry point for increasing your customer prospect and conversion rates. As a professional, you need the best, at short notice. For this reason, we have adapted IQUALIF CPE to suit your needs: a simple and functional tool that will meet all of your requirements. Our goals as of 2018 include: refining and simplifying existing software to increase the extraction rate. 06/11/2015: online publication of a minor patch for versions covering the French and Moroccan Yellow pages. - IQUALIF Tunisia Yellow used to download business data from the Tunisian yellow pages. - IQUALIF Africa Yellow used to extract professional data from 51 countries in Africa. 04/22/2015: New Mac and Windows installer, which includes a fix for the browser mode display. 03/23/2015: upgrade for IQUALIF Yellow France, to extract contacts from the Yellow pages from a list of cities, counties or regions and export them to Excel. 01/06/2015: all the best for 2015 ! We have some nice surprises in store for you this year. We will strengthen logistics to ensure quality of service (QoS) remains consistent. The software will be standardised to increase running speed and simplify user interactions. We will also be providing new features that will benefit a broad range of marketing professionals. Happy New Year 2015 from the management team at IQUALIF ! 11/28/2014: new product launch: IQUALIF Italy Yellow Italian professionals to extract professional data from the Italian 1254.virgilio.it directory. The extraction of email data is included. 11/18/2014: new product launch: IQUALIF Spain Yellow Spanish professionals to extract professional data from the official directory of Spain: paginasamarillas.es. The extraction of email data is included. - Upgrade for the extractor used for English professionals, find it in the download area. This solution allows the extraction of data from popular directories Yell.com and Scoot.co.uk. The extraction of email data is included. - Software upgrade for the extraction of professional data from Morocco. This version allows you to capture data from the directory telecontact.ma. The extraction of email data is included. - Launch of an extraction software for Australia, find it on the download page. Reinstall the latest version to get even more contacts through optimised management of events. - Update for the Canada and United States Yellow pages solutions with the latest version of this application. - Update for the USA White pages version that allows the extraction of individual data from the United States from the official directory: British Columbia Telecom. - Release of Kapa White and Yellow versions to extract contacts details from the site: Kapaza Belgian ads. - Added Mass Mailing module and automatic entry forms in the Yellow versions to enhance your marketing operations. - Added an OCR plugin. 08/02/2014: update of Belgium Yellow pages Version to extract professional data. This includes a new feature, which allows you to reach your contacts more easily. 07/22/2014: launch of Iqualif Viva White and Yellow to extract individual and professional data from the Site: Vivastreet. 07/13/2014: you cannot expect the release of Iqualif BCoin White and Yellow to extract the ads from Le Bon Coin. 07/07/2014: Update for IQUALIF’s Switzerland Yellow pages version. This includes access to the latest features. Minor correction of display accents. 05/15/2014: update for IQUALIF Canada ‘s White pages version to allow for the extraction of more contact data. 05/09/2014: new product launch : IQUALIF Yellow England for a list of English professionals. 05/07/2014: release of a minor fix for the Netherlands and France Yellow pages versions. 05/06/2014: activation of a collective housing and title filter to IQUALIF France, Switzerland and Morocco White pages versions. Update for IQUALIF France White and Yellow versions. 04/07/2014: IQUALIF 712 now online, featuring the extraction of professional email data from the White and Yellow pages directories. This version allows 118712.fr to collect individual and professional data. 04/04/2014: Were you expecting it? Probably not, but we thought we would put it out there anyway! Launch announcement for IQUALIF United States Yellow that allows for the extraction of professional data and, email data. IQUALIF is now available to create your prospective client files for the United States of America, and a new translation module is now integrated in the software. 03/28/2014: new product launch: IQUALIF Belgium Yellow that allows for the extraction of professional data and email data. 13/03/2014: IQUALIF Canada and Polynesia White & Yellow versions are now available ! 04/03/2014: A new version of IQUALIF France White and Yellow is available, the user interface has been redesigned and 4 new search modes are now available to give you more search freedom and provide a clearer presentation of your research. Launch of new server dedicated to the optimisation of customer exchange. Acquisition of 2 new machines for testing and development. www.capturepagesjaunes.com site redesign, making it more attractive and user-friendly. 01/15/2014: Launch of IQUALIF 1.098.6, the interface has been simplified and optimised to increase download speed in order to provide you with even more contacts. Revision of the automatic refresh lists. Expansion of the topic list for France IQUALIF Yellow version. Reorganisation of the activities of the yellow pages and rank sections. Revision of alphabetical sorting function. 11/22/2013: Update for France White IQUALIF 1097. The interface has been improved, the list of available streets has been expanded and standardised to provide you with even more contacts. We encourage our users to update their versions to capture more contact. IQUALIF Switzerland 1097 White is also available. Find it in the download area. 28/10/2013: IQUALIF 1096 is now online and the interface is available in 3 versions, all of which have been revised and improved. - Added buttons to refresh list content. 14/14/2013: Searching for contacts in Luxembourg? We have the solution, and announce the launch of IQUALIF Luxembourg White and Yellow pages version, that allows for the extraction of professional data and, email data. 10/09/2013: launch of version IQUALIF CPE 1094, the anti-blacklist system has been optimised to download contacts at an even faster rate, and new options have been added to settings. The duplication functionality has been refined and filtering of professionals is now automatic. The interface has been optimised, making it more attractive and practical. 09/30/2013: The extraction of professional data and email data has been added to all versions of IQUALIF Yellow pages. You can now extract email data from the French yellow pages and Switzerland local.ch. Two extraction modes are now available: fast mode and full mode. 09/21/2013: Release of Yellow IQUALIF Switzerland version, this software allows you to extract all Swiss professional data from the local.ch directory. Before 2013: IQUALIF France Yellow 1.08 is now available, it can extract even more information. The extraction of numbers starting with 0800 has now been added. White IQUALIF France, Belgium and Switzerland White White 1.08 are now available; the interface has been optimised and refined to extract to obtain even better results.